Recovery Day is an annual awareness day observed in Canada on September 30. It is dedicated to people who have coped with drug, alcohol and behavioral addictions, achieving long-term sobriety. In the United States, September is officially recognized by the Substance Abuse and Mental Health Services Administration as Recovery Month. Inspired by advocacy movements in the US, Lorinda Strang and AnnMarie McCullough of the Orchard Recovery Center on Bowen Island, British Columbia, developed the concept of an annual event called Recovery Day. 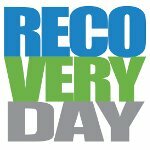 Recovery Day was first observed on September 30, 2012 in Vancouver. It was declared by an official proclamation from Mayor Gregor Robinson. The following year, a dozen cities throughout Canada hosted Recovery Day events. In 2015, close to 30 cities participated in Recovery Day and held events and activities. The main goals of Recovery Day are to raise public awareness about the addiction problem, to fight prejudice and stigma against addicts, and to demonstrate and celebrate the ability of those with additions to achieve long-term sobriety and live productive and healthy lives. Recovery Day events and activities are mainly organized by volunteers. They include marches, community fairs, breakfasts and luncheons, BBQs, live concerts, mutual support groups, speeches of local politicians, government officials and professionals, and more. Former addicts come forward to share stories of their experience, helping people to make the first step on the journey to recovery.